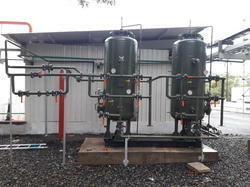 We are engaged in offering a wide range of Waste Water Treatment Plants that are used for removing impurities from the water.These water treatment plants are also used for water softening and demineralization of water.Designed and developed as per the defined quality standards, these are widely used for organic treatment of water that can be be further used in industrial purposes. We offer our technical expertise for designing, operating and maintaining the Waste Water Treatment Plants. Application to remove free chlorine, organic matter, odour and Colour present in the raw water and waste water. The Activated carbon Filters are designed to remove free chlorine, organic matter, odour and Colour present in the raw water and waste water. Due to its high degree of micro porosity, activated carbons provide a huge surface area. Activated carbon filter operates through adsorption. Adsorption is directly related to the surface area of the media. This great surface area furnishes a huge adsorption area for organic as well as chlorine molecules to attach themselves. Inclusive of 1 set of valves & filter media. These filters are the most popular method for removal of turbidity from water. The Pressure Sand Filter consists of a multiple layer of sand with a variety in size and specific gravity. These Filters are designed to remove turbidity and suspended particles present in the feed water with minimum pressure drop.